I don’t have any grandchildren….yet. But I have the next best thing! Grand-dogs! You can see the day they rocked the first baby’s world here. They used to live down the street from us and visit all the time but my daughter and her husband moved to Colorado this summer and I now I hardly ever get to see them. I miss them all terribly. Do you think they remember me? When I visit them it seems like they do, but I can’t tell….they pee with excitement EVERY time ANYONE comes into the house so I am not sure I am that special. 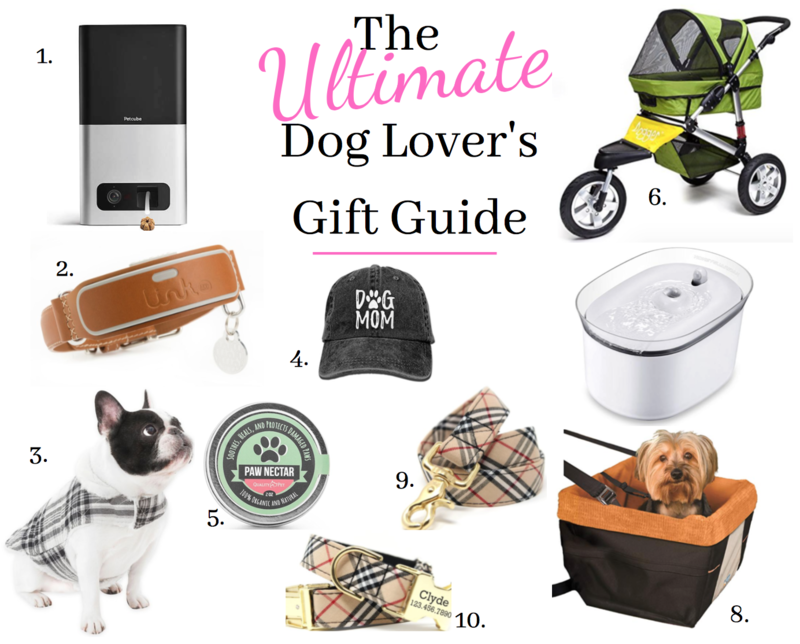 My kids love their dogs as much as any human so today I am bringing you the ULTIMATE GIFT GUIDE FOR THE DOG LOVER in your life! I think I may have to get a few of these things for my beloved pooches and grand-dogs. 1 // Hate being gone from Fido? This allows you to see and reward your little guy….just for being him! Equipped with a pet cam, you can see your pooch day or night from your phone, talk to him and give him the treats he deserves even when you’re not home! this amazing collar. Equipped with GPS tracking, you will be able to locate your furry friend ASAP from your phone! It also has a fitness tracker and a temperature gauge that alerts you if he gets too hot or cold! 3 // Baby it’s cold outside! But it doesn’t have to be! Your baby doesn’t have to suffer from being cold anymore and Uggs aren’t just to cozy our feet anymore, they make the most adorable coats for our furry friends. this adorable cap! Adjustable straps in the back. Dog lovers unite! this amazing, fast acting paw wax to ease the discomfort. All natural and organic. 6 // Can’t bear to leave your pup at home? Dreaming of taking her with you on a run but she just can’t keep up? Love long walks but sweetie is too old to go along? This adorable stroller is the answer and is good for all different terrains and weather. 7 // A censored drinking fountain for your pup? Automated by a sensor to run fresh water when your sweetie steps up to the bowl…I think they have thought of everything now! Your pet will have clean, filtered water all day. I love this! this in my life! It keeps her safe AND gives her a view! It tethers her in AND attaches to the seat high enough so she can see out. Accident avoided. 9 // If you love a good Burberry, you will love this leash! Your pooch will be the most stylish pooch on the block. Burberry….clever. 10 // Also, this adorable collar comes with your dog’s name and information engraved right on the elegant gold clasp. No need for a separate tag! So cute. Not a Burberry fan? You can order it to match the leash above and they have a variety of fabric choices. I hope you found something here that the dog lover in your life will love! Have a great week, friends!